Corporate citizenship is more than a trend – it is an essential component of how businesses operate today. Forward-thinking organizations increasingly need leaders who understand the complexities of issues such as sustainability, corporate social responsibility, and ethics – and how these tie into innovation, agility and winning in the market. Many sustainable MBA programs have focused attention on “the triple bottom line” – People, Planet, Profits. While this is a formidable start, the SEER Certificate program goes a step beyond and adds a fourth factor to the equation: Product – because delivery of a quality product or service is essential for a sustainable competitive advantage in any business. Great products or service are embedded with the SEER values from the early product development stage or idea generation. The values are not simply “added on” to the product or service before launch. 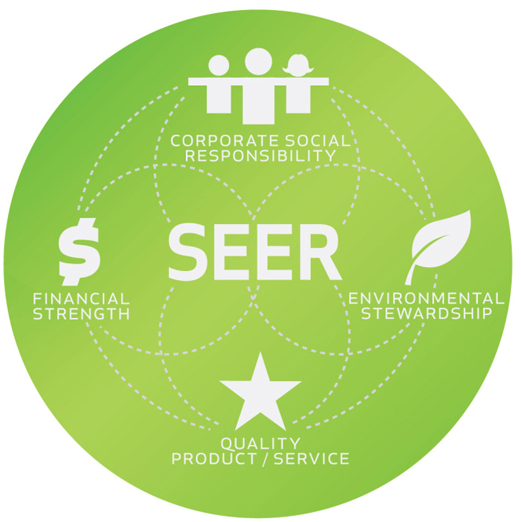 These four macro-values – Corporate Social Responsibility (“People”), Environmental Stewardship (“Planet”), Financial Strength (“Profits”), and Product/Service – illustrate the crux of the SEER philosophy. These values do not operate in isolation. Rather, they function as a system with many areas of overlap and interaction. Decision-making is rarely, if ever, guided by one of the four values individually.